Harrison Edwards and his brother both caught several really nice fish today fishing artificial lures in the cattails and dollar pads today. The fog hung around until about 11am letting very little light through the clouds which made the bite today hang on longer than normal. 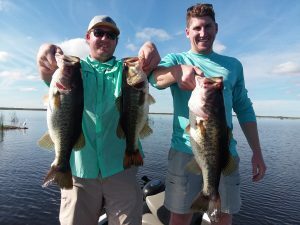 We caught these fish on a couple different swim baits and some top water frog action as well. We were having so much fun catching them that we let a few go that we should have gotten pictures of but didn’t. We had a few fish come up on the swim baits and blow up on it or wake behind it and never hit it as well. The bite is going to continue to get better and better as long as we can keep some clean water and low winds. I am SO looking forward to the next couple of weeks as some of the bigger fish move up in waves. Got a feeling I will be seeing more of these young men after what they saw and experienced on the lake today. 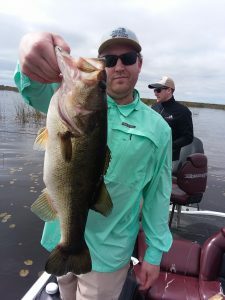 Want to book a trip come on down and join us this Spring!